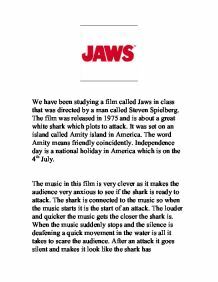 We have been studying a film called Jaws in class that was directed by a man called Steven Spielberg. The film was released in 1975 and is about a great white shark which plots to attack. 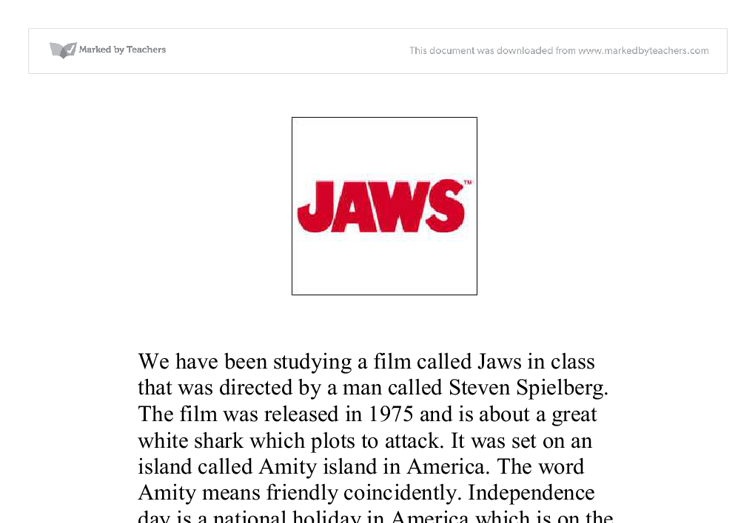 It was set on an island called Amity island in America. The word Amity means friendly coincidently. Independence day is a national holiday in America which is on the 4th July. The music in this film is very clever as it makes the audience very anxious to see if the shark is ready to attack. The shark is connected to the music so when the music starts it is the start of an attack. The louder and quicker the music gets the closer the shark is. ...read more. By showing the damage of the shark on things like surfboards, boats and people it makes you think if a person gets attacked that they have no chance of survival. When the characters reactions are nervous and scared comments and actions the audience then feel slightly nervous and weary. After the first two attacks the films tends to slow down a bit, the main reason is they want you to think there is a chance for the people to catch the shark or kill it. When they catch the wrong shark it then is made out to believe the shark is invincible and untouchable. When some of the people go out at night on the boat it makes the audience think something will happen as they think it is more dangerous because it is dark, the director tries to make it look like something is about to happen but in most cases nothing does. ...read more. I think at the climax of the film it is more tense than ever before as there is only three men on a boat and no one to help. When the shark comes close the tension really starts to build because the shark is the favourite to come out on top. The director tries to avoid the shark being spotted so it springs onto the frame. He does this because he is trying to get the audience out to the edge of there seat. My opinion of the scariest point of the film is at the end when the two men left on the boat are trying to survive while the boat is sinking and the shark is waiting to kill them. My main reasons for this was because it is mouth watering waiting to see what happens and it grabs you and you are hoping the men will survive Gavin O'Keefe 11e ?? ?? ?? ?? ...read more. The use of humour from this irony will mean that when the audience laugh along, they subconsciously agree with Moore's ideas. Moore uses implicit criticism to display the actions that America has enforced on other countries. These criticisms are both subtle and not-so-subtle in place of this scene. It stresses that these people really had families who cared for them and are of some significance to history. Another use of historic material is made when a genuine Winston Churchill speech is played during the end; this anchors the film into history and again reinforces Spielberg's main policy of realism. The first significant camera angle used is when Andy is placing the books in the safe for the very last time. The angle is shot from in side the safe looking out towards him. As the door is shut so is the metaphorical door on the audience because they no longer know what's really going on in the film. "One morning a man I hadn't seen before appeared in our back yard... Then he winked. I'm Eric." This confrontation gives the reader an insight into the unpredictable environment that young Drewe is surrounded with, depicting the innocence of the setting and the dark shadow Cooke cast over it. family members out of the sea, there is a general pan/long shot of this. The audience is worried and they also want to know if Brody's family is ok or if someone else is going to get attacked. The camera is shot from a pan on to Alex's mum who is looking for him. The colour of the yellow contrasts with the red of the blood makes you notice it in the sea. The size of the bite mark gives the audience an idea of the size of the shark. The silence used at the end of the attack effects the characters and the audience alike because we both feel shocked, frightened and sad. He breaks wind and kills fish, one of which floats to the surface. He has a gross mannerism and the signs next to his home says: "keep out, Ogre beware". Shrek is portrayed as a vicious large Ogre who is anti-social who roars and scares people with his smelly mouth.